Working with Geoporter’s Amy Work ’04 (far left), the OWU team included (from left) Professor John Krygier, Olivia Lease ’17, Michael Durfee ’17, Christopher Pessell ’18, Luke Steffen ’16, Maddy Coalmer ’18, and Assistant Professor Nathan Amador Rowley. Looking out at the lush, vivid greenery around her simple home in Costa Rica, Amy Work ’04 can scarcely believe her good fortune. The sky is a gorgeous blue, a crystal-clear ocean is nearby, colorful tropical birds swoop overhead, and the sunshine is endless. It’s a far cry from her growing-up years in Westerville and her college years at Ohio Wesleyan University, where weather tended more toward overcast skies and freezing Midwest winters. A lofty sentiment, to be sure. But one she believes in so firmly that she’s trying to pass it along to other OWU students by inviting them to visit—and learn—in her little piece of paradise. Work’s life on the eastern coast of Costa Rica centers on something she was introduced to at Ohio Wesleyan: GIS—geographic information system—technology. In its simplest form, it’s a way to display several sets of data on a single map so users can see and analyze the relationships between each. Accessed through computer software, the technology is used in fields ranging from archaeology to mosquito control to politics—anything that can use location as a factor. GIS technology was growing in popularity in 2000 when Work was an OWU freshman taking a mapping course taught by geology and geography professor John Krygier. “That class talked about how maps have helped us understand the world over time, and at the end it talked about GIS,” Work says. A follow-up class taught her the nitty-gritty of GIS and convinced her of its power. By the time she graduated in 2004 with a triple major in geography, urban studies, and environmental studies, she knew she wanted to pursue a career centered on GIS. Work was sharp, focused, and fully engaged in learning about GIS, Krygier says, especially in upper-level courses where students used the technology to help map potential pathways for future Delaware bike paths. Eventually, Delaware created new paths based on the students’ work. After graduating from Syracuse University with a master’s degree in geography in 2006, Work became an education and GIS coordinator at the Institute for the Application of Geospatial Technology, or IAGT, in Auburn, New York. Through her work there she met Anita and Roger Palmer, founders of GISetc, a for-profit company that helps educators learn to use GIS in the classroom. 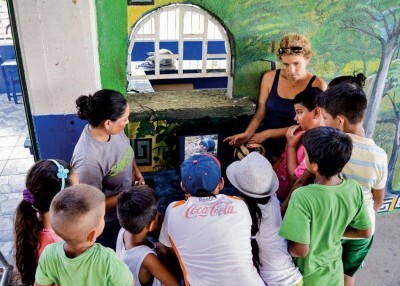 Beginning in 2009, the Palmers began traveling to the Costa Rican coastal village of Bahia Ballena to introduce GIS to community leaders, in the hopes the technology would help the village transition from a farming-and-fishing economy to a tourism economy. When it became obvious the couple’s yearly visits weren’t enough for the project to prosper, they asked Work to live and work there full-time. That’s what she’s done since August 2012. She’s funded by Geoporter, a nonprofit organization set up by Work, the Palmers, and two Bahia Ballena community members. It’s designed to send educators around the world to do exactly what Work is doing in Costa Rica: solve local issues with GIS. This is Geoporter’s first project. 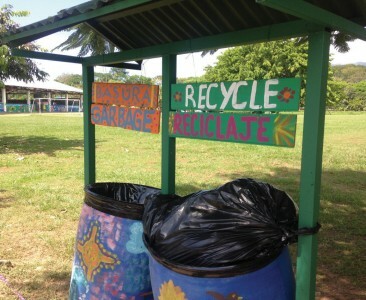 Bahia Ballena leaders decided to tackle trash in the streets with the help of GIS. For a decade, trash had been picked up curbside at homes, but in public places, residents tended to toss it on the ground, Work says. As a result, trash ended up in local streams and then in the ocean, reducing the area’s appeal for tourists. Work suggested mapping where trash was coming from as a first step. In 2013, she and community members collected trash at specific intervals on the road, counted the kinds of trash found there, and mapped the results using GIS. They found a high concentration of candy wrappers outside grocery stores near schools, for example, from students buying candy on their way home. Soccer fields—popular community gathering spots—had food wrappers and bottles. An analysis of the mapped trash produced action within the year: Trash cans with sections for recyclables and sections for non-recyclables were added where they would reduce the most trash, and an education program encouraged residents to use the cans. Since then, trash in streams has diminished and more is being recycled—exactly what Geoporter was set up to accomplish. To spread the word about the success and encourage others to embrace the technology, Work turned to her alma mater. She contacted Krygier, who had first taught her GIS, and his new colleague, Nathan Amador Rowley, and asked: Would Ohio Wesleyan students be interested in working with Geoporter? The idea jelled when Work returned to the states in 2014 to be inducted into the Ohio Wesleyan Athletic Hall of Fame for her starring role on the Battling Bishops’ national title-winning women’s soccer teams of 2001 and 2002. She talked up her GIS project with Ohio Wesleyan President Rock Jones and by 2015, Amador, with Krygier’s help, was offering a travel-learning course to Costa Rica. Such courses are a core element of The OWU Connection, helping students connect classroom learning with real-world practice in global settings. The proposal had clicked with Amador, an assistant professor of geology and geography who’d begun working at Ohio Wesleyan in 2014. He was teaching Environmental Alterations, a required class for environmental studies majors, and added the Costa Rica portion as an option for additional class credit. By December 2015, five students, along with Amador and Krygier, were bumping along the mostly unpaved roads of Costa Rica. Each had completed an environmental project centered on the country before their trip, and their 11-day visit expanded on those projects. Madeleine Coalmer ’18 examined the effects of ecotourism, global warming, and climate change on water supplies in Costa Rica. She wanted to find out what could be done in the future to reduce yearly water shortages during the dry season. She soon realized that even her use of water at home in Youngstown, Ohio, could ultimately affect the water supply in Central America. “When my mom picked me up from the airport after the trip, the first thing I told her was I’m going to be more cautious of how much water I’m using,” she says. Coalmer also learned how much opportunity her chosen major, geography, can provide. Chris Pessell ’18 of Cincinnati had studied the impact of African palm-oil plantations on the soil, water, animals, and plants of Costa Rica. African palms were brought to the country after Costa Rica’s banana-growing industry shut down. While they’ve helped the economy, native mangrove forests have been destroyed to make way for the plantations. Pessell’s view of the industry changed when he visited a plantation on the trip. He realized he’d inflated its harm to the environment. “I assumed it was like a tree farm, but there was a carpet of plants under the trees and a ton of different bugs,” he says. As long as the plantations aren’t expanding, he says, it doesn’t appear they’ll do additional damage to the environment. Pessell particularly enjoyed another trip project: testing water in the Bahia Ballena area to ensure clean drinking water is available. After the trip, he helped map the data and hopes to add more as additional testing is done periodically. 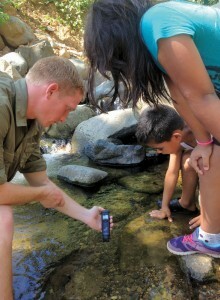 The work cemented Pessell’s plan to pursue a career in water-quality testing when he graduates with his geography major. Interestingly, neither Work nor Amador had opportunities similar to the Costa Rica trip while they were students. Work’s plans to travel abroad were dashed by 9/11. Instead of traveling, she applied her GIS knowledge on local projects as a student, such as the bike-trail project. For Amador, plenty of opportunities for study and travel existed at The Ohio State University where he obtained his undergraduate degree, but he had no money to participate. The January trip was the second time an Ohio Wesleyan student had visited Work. The first was a year ago, when graduate Christian Gehrke ’15 took a University drone to Bahia Ballena to capture a birds-eye view of the community. The new imagery updated some from 2011 and has a higher resolution. Work will use it to see changes in the environment over time. Krygier hopes the collaboration with Work spurs similar collaborations with OWU alumni. 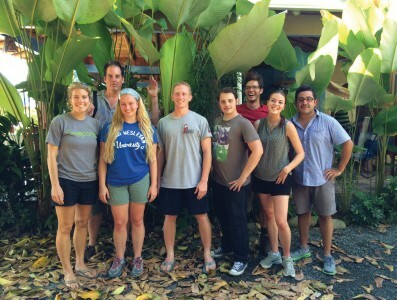 In Costa Rica, the link between alumni and OWU continues. Amador visited this summer to take more water samples, and another OWU student took additional aerial photos with a drone. Work appreciates the extra hands, the equipment and the enthusiasm that students and professors bring to the Geoporter project, but she also sees the collaboration as a way she’s giving back to the University. Kathy Lynn Gray is a freelance writer from Columbus, OH. To learn more about the GIS project and travel-learning course, see flickr.com/photos/geoporter/ and geoporter.net, or contact Amy Work at amy@geoporter.net.